Finnex FugeRay Marine+ II Aquarium LED Light Fixture. 12 Unibody Ultra Slim High Output Marine LED. Perfect Fish Only, Softie, LPS Reef Light. (14) 10000k + (22) Actinic Blue LEDs, Separate switches. 16 Unibody Ultra Slim High Output Marine LED. (21) 10000k + (35) Actinic Blue LEDs, Separate switches. 15 Watt Coral Supporting Fixture. 20 Unibody Ultra Slim High Output Marine LED. (24) 10000k + (40) Actinic Blue LEDs, Separate switches. 18 Watt Coral Supporting Fixture. 24 Unibody Ultra Slim High Output Marine LED. (27) 10000k + (45) Actinic Blue LEDs, Separate switches. 20 Watt Coral Supporting Fixture. 30 Unibody Ultra Slim High Output Marine LED. (36) 10000k + (60) Actinic Blue LEDs, Separate switches. 25 Watt Coral Supporting Fixture. 36 Unibody Ultra Slim High Output Marine LED. (42) 10000k + (70) Actinic Blue LEDs, Separate switches. 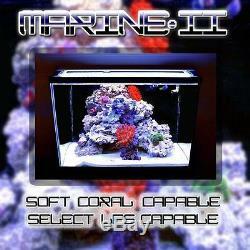 32 Watt Coral Supporting Fixture. 48 Unibody Ultra Slim High Output Marine LED. (54) 10000k + (90) Actinic Blue LEDs, Separate switches. The Finnex FugeRAY Marine+ 2 packs the light output of the original Marine+ in a much more econimcal package. This Contemporary Ultra Slim designed LED fixture features a series of LEDs to promote Marine Refugium & Freshwater growth. Unlike the Ray II which incorporates multiple High Output LEDS pinched together for high light output, the FugeRay features a more evenly spaced LED alignment ideal for refugium purposes as well as low-medium light needy aquariums. The FugeRay Marine+ also features moonlights on a separate switch, which can be activated during the evening to give the aquarium a pleasant moonlight tone. All models feature a moisture resistant PC Splash Guard to protect against water mishaps. Unlike the Ray II DB which incorporates multiple High Output LEDS pinched together for high light output, the FugeRay Marine+ features a more evenly spaced LED alignment ideal for general marine aquarium applications such as soft coral stocked or fish only aquariums. This all-round all purpose light also features its actinic moonlights on a separate switch, which can be activated during the evening to give a pleasant moonlight tone further making corals vibrate throughout the aquarium. The durable high output LED bulbs are built to last 40,000+ hours. With a LED spread of 120 degrees, this slim LED bar lights up the largest of aquariums. A unique leg fixture allows this LED light to mount on various sized aquariums and sump setups. To extend LED bulb longevity, the circuit boards are built with high quality aluminum and the fixture itself acts as the heat sync to allow ample cooling and superior heat dissipation. Communication is an important part in giving you an enjoyable encounter, and in making sure that all of your needs are taken care of. We understand that it is important for our customers to get what they ordered as fast and as hassle free as possible. We work with suppliers with high quality products to give you the best goods possible. It is important for us to give our customers an enjoyable experience, as we put our customers first. In the uncommon occurrence when a customers is not contented with the product they receive, we will do all that we can to fix the issue. If you have any inquiries, please let us know and we will fix it! We promise the best when shopping with us. The item "Finnex FugeRay Marine+ II Aquarium LED Light Fixture" is in sale since Wednesday, September 21, 2016. This item is in the category "Pet Supplies\Fish & Aquariums\Lighting & Bulbs". The seller is "reefguy007" and is located in La Grange, Illinois. This item can be shipped to United States, Canada, United Kingdom, Denmark, Romania, Slovakia, Bulgaria, Czech republic, Finland, Hungary, Latvia, Lithuania, Malta, Estonia, Australia, Greece, Portugal, Cyprus, Slovenia, Japan, China, Sweden, South Korea, Indonesia, Taiwan, South africa, Thailand, Belgium, France, Hong Kong, Ireland, Netherlands, Poland, Spain, Italy, Germany, Austria, Israel, Mexico, New Zealand, Philippines, Singapore, Switzerland, Norway, Saudi arabia, Ukraine, United arab emirates, Qatar, Kuwait, Bahrain, Croatia, Malaysia, Brazil, Chile, Colombia, Costa rica, Dominican republic, Panama, Trinidad and tobago, Guatemala, Honduras, Jamaica.